In an environment when many law firms practice in several different areas, the attorneys at Peterson Estate Planning realized that to truly offer the quality of estate planning services that people deserve, one must do more than just "dabble" in estate planning or provide clients with form estate plans. This is why Peterson Estate Planning was created, not to offer the run of the mill estate plans, but to provide the highest quality of estate planning with the personal touch necessary for effective planning. Each client we help we consider a life-long friend and we do for them what we would want done for our own families or ourselves. Peterson Estate Planning strives for 100% satisfaction with each client. Adam is a member of WealthCounsel, the Utah Valley Estate Planning Council, the Estate Planning Section of the Utah State Bar, and the National Association of Estate Planners and Councils which allows him to provide Utah families the best estate planning services. Adam received both his Juris Doctor and MBA degrees from Creighton University in Omaha, Nebraska. Adam received a bachelor of arts in communication (emphasizing in public relations) from Brigham Young University-Idaho. His foremost desire with his profession and life is to make a difference in the lives of those with whom he comes in contact. While in law school and throughout his legal career, Adam has gained a great love for estate planning and business planning and decided that he wanted to dedicate himself to counseling clients through these planning processes. Adam considers all of his clients lifelong friends. 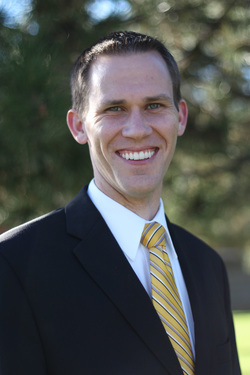 Jared is a California licensed attorney with a diverse legal background in both state and federal courts. Throughout his legal career, he has represented and advised companies, government agencies, and individuals in various complex legal matters. Jared has assisted individuals and families in the different phases of the estate planning process, from the creation of estate planning documents to the disbursement of estate assets. He enjoys using his abilities to help people reach the peace of mind that comes with knowing that their affairs are in order with respect to their real and personal property.